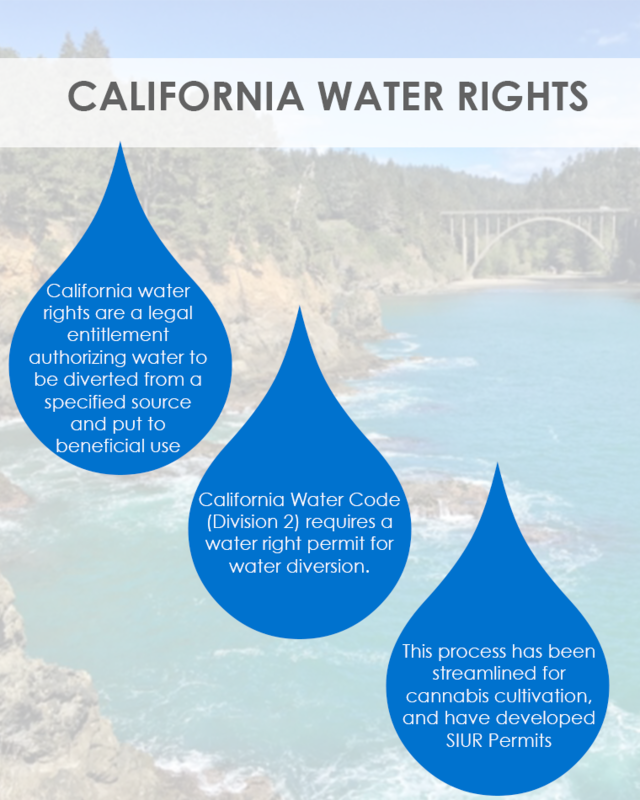 The reason that a water rights permit is unnecessary for rainwater harvesting is the State of California AB-1750 Rainwater Capture Act of 2012 (link to AB-1750). The State Statute provides that rainwater captured off of rooftops doesn’t require a water right permit. A statement of diversion of surface water is required by California Water Code Section 5101. California law has required those who divert surface water or pump groundwater from a known subterranean stream to file a Statement of Water Diversion and Use, or diverters to file an application to appropriate water with the State Water Resources Control Board, Division of Water Rights. Cannabis cultivators that plan to divert surface water need a water right to irrigate cannabis. The Cannabis Policy requires cannabis cultivators to stop diverting surface water during the dry season. 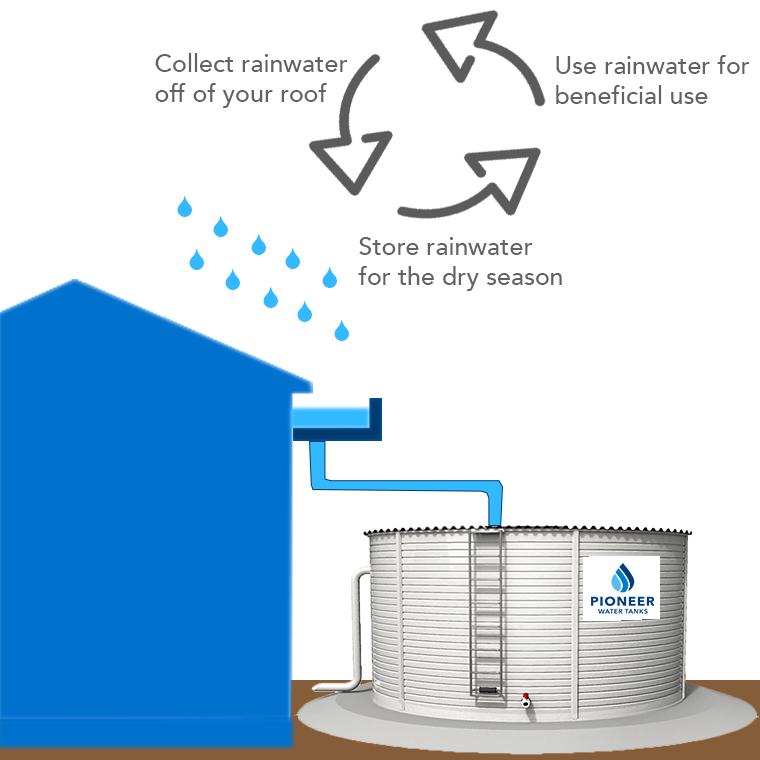 This means that water must be diverted during the wet season and stored for use during the dry season. Water is required to be stored off-stream. Cannabis cultivation legislation enacted California Water Code (Water Code) section 13149 (link), which directs the State Water Board, in consultation with the California Department of Fish and Wildlife (CDFW), to adopt interim and long-term principles and guidelines for the diversion and use of water for cannabis cultivation in areas where cannabis cultivation may have the potential to substantially affect instream flows. The State Water Board holds the dual mandates of allocating surface water rights and protecting water quality. The entire parcel, including easements, streams, springs, ponds and other surface water features. 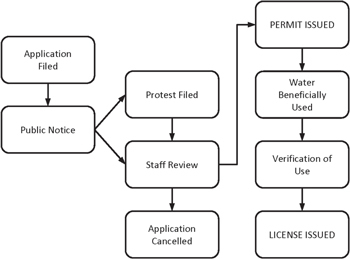 Copy of the statement of water diversion, or other permits, license or registration filed with the California State Water Resources Control Board, Division of Water Rights. 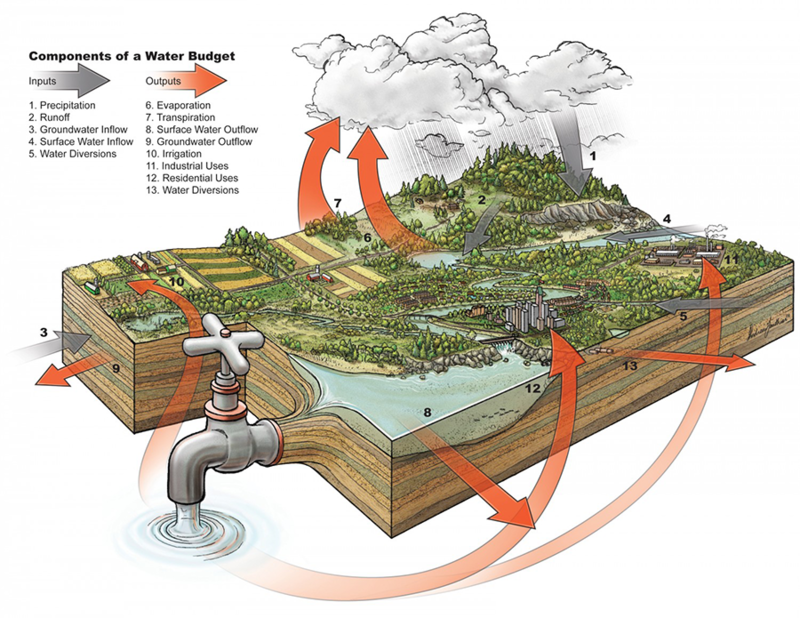 Description of a water source, storage, irrigation plan and projected water usage. 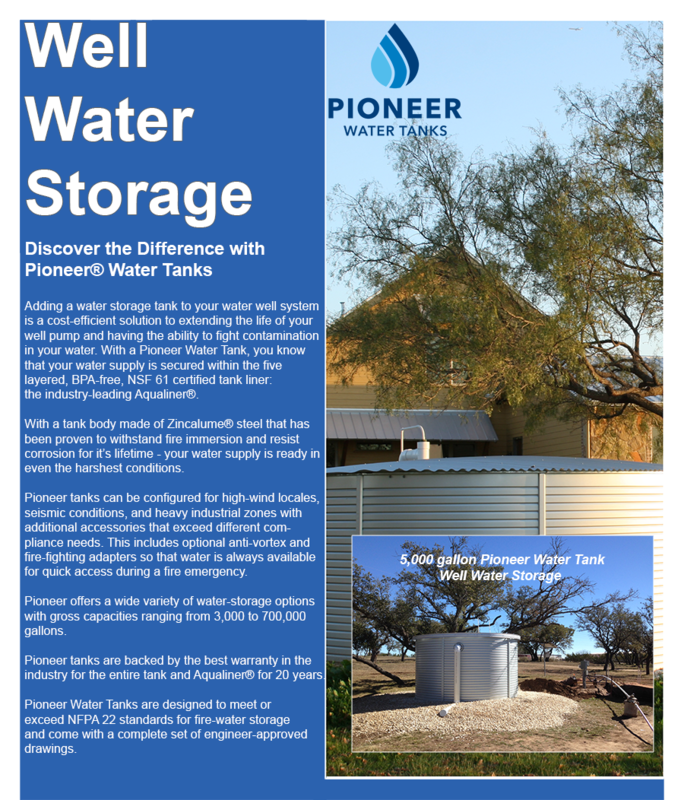 If the source of water is a well, a County well permit needs to be included for plan submittal. The California Department of Water Resources has the authority for developing well standards. California Water Well Standards, published as DWR Bulletin 74 (link), represent minimum standards for water well construction, alteration, and destruction to protect groundwater. In California, cities, counties, and water agencies have regulatory authority over wells and can adopt local water well ordinances that meet or exceed the statewide Well Standards. When a well is constructed, modified or destroyed, drilling contractor are required to submit a Well Completion Report. Contractors can submit these and the public can access them through our Online System for Well Completion Reports (OSWCR). When an individual or business takes water from a lake, river, stream, or creek, or from underground supplies for a beneficial use, the California Water Code (Division 2) requires a water right permit. 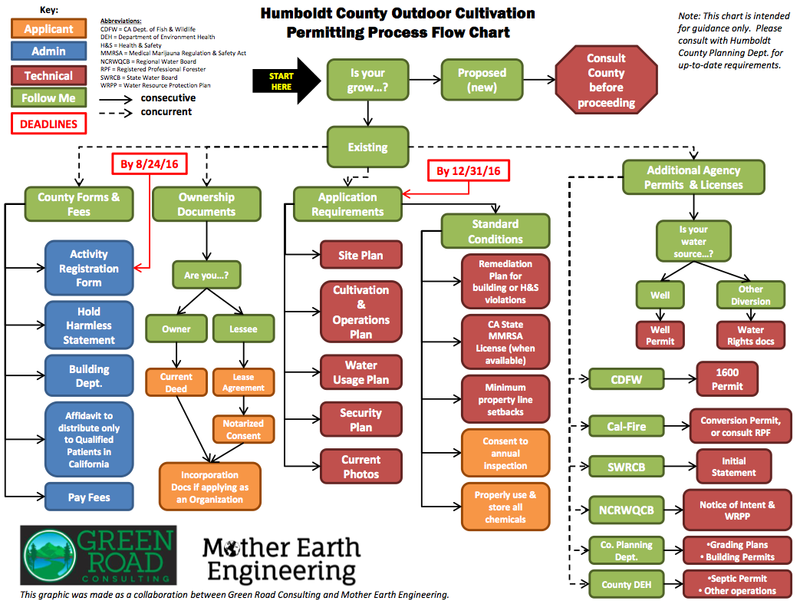 Although cultivators often have multiple options to establish a water right for their water supply, the State Water Board anticipates that many cultivators will choose the Cannabis SIUR (Small Irrigation Use Registration) because it is a faster and easier way to obtain a water right in comparison to the application process for a new appropriative water right, which can take many years. In accordance with this Policy, cultivators who rely on surface water to irrigate their cannabis operation are required to divert to storage during the wet season (portions of fall/winter/spring) and forebear from diverting during the dry season (summer/portions of fall). 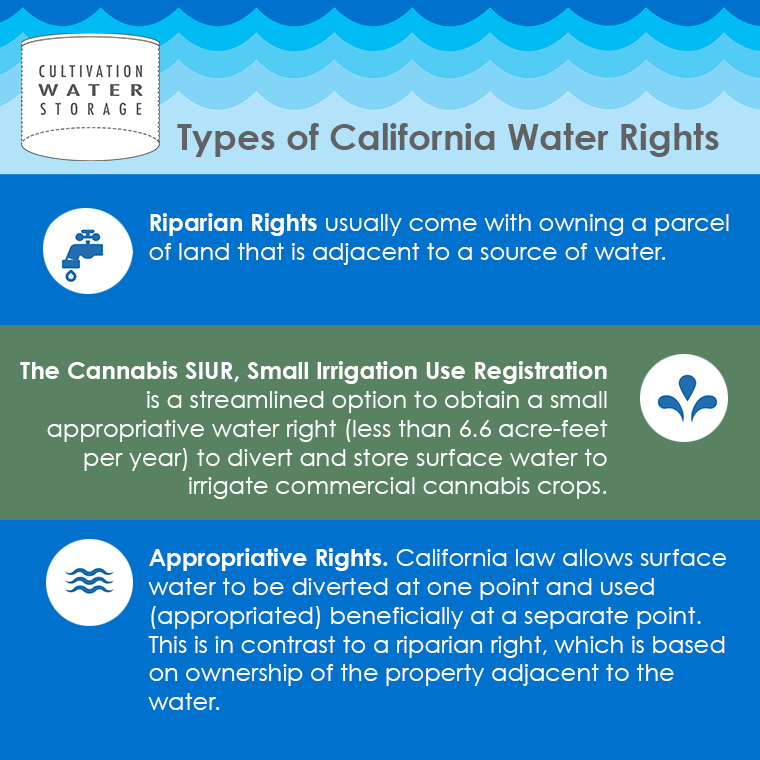 Riparian water rights do not allow for water storage, riparian water right holders who intend to cultivate cannabis will also be required to obtain an appropriative (storage) water right (most likely through the Cannabis SIUR) in order to comply with the Policy. Cannabis cultivators shall not divert surface water unless it is diverted in accordance with an existing water right that specifies, as appropriate, the source, location of the point of diversion, the purpose of use, place of use, and quantity and season of diversion. Cannabis cultivators shall maintain documentation of the water right at the cannabis cultivation site.